“Mommy why are the police mad? The police pushed me…” the small African American girl said to her mother as she and a handful of other young girls were shuffled into the arms of a waiting grandmother. Looking down I saw a sight that seared itself into my memory: five pairs of eyes, in five little faces, welling with tears that balanced on the very brink of overflow and the very depth of terror. I have never seen anything so painful in my life. Except the eyes of Sandra Bland’s sisters overflowing with tears as I looked into them at Hope AME and committed to stay at the Waller County Jail as long as they needed. Or that pair of eyes, similar to theirs, that cause me even more pain: the eyes of Sandra Bland, brilliant and lively in her videos, a constant reminder that her eyes will never well with tears again, and because of that ours must. I came close to see what was happening and then stepped back as a news camera asked me to get out of the way so that they could dive into the midst of the crowd. I turned to answer someone’s question when suddenly my attention was snapped back to the doors of the jail as screams erupted and people started tumbling over one another out of the doors. They weren’t so much fleeing as falling, like grains of sand sliding down an incline when you try to force them up into a pile. “Get behind me,” my friend Steven called out, directing me back from the conflict in the same direction that that mother took the little girls. I looked down to my right, into their eyes, overwhelmed with the sorrow of their fear. The doors of the jail pulled shut and were chained, and I thought that it was over until people started to chant, “Let them out! Let them out!” and realized to my horror that people were trapped inside… I realized to my horror that the mothers of some of these little girls were probably trapped inside… I realized to my horror that these little girls were watching their mothers be trapped inside a building where another young African American woman had lost her life, the woman whose name we chanted: Sandra Bland. Things I did not know at that moment: I did not know what was happening inside. I did not know that crowds of troopers in riot gear were waiting around the corner ready to charge at the slightest provocation. I did not know that officers were pulling assault rifles out of their cars. I did not know that one of my mentors PK was trapped inside. I did not know which of these set of terrified eyes knew that their mother was trapped inside. Things my friends did not know at that moment: Where I was. Having become one of the most recognizable people at the Waller County Jail after 26 days of sitting vigil, my friends experienced several minutes of terror as I seemed to have disappeared in the midst of the confusion. They did not know that I was standing further back with my body planted between those five sets of eyes and the County Jail. The people trapped inside the jail were eventually led out through another door. Amazingly, they had captured every second on tape on the little devices that Sandra Bland said were powerful enough to change things in this country: cell phones. 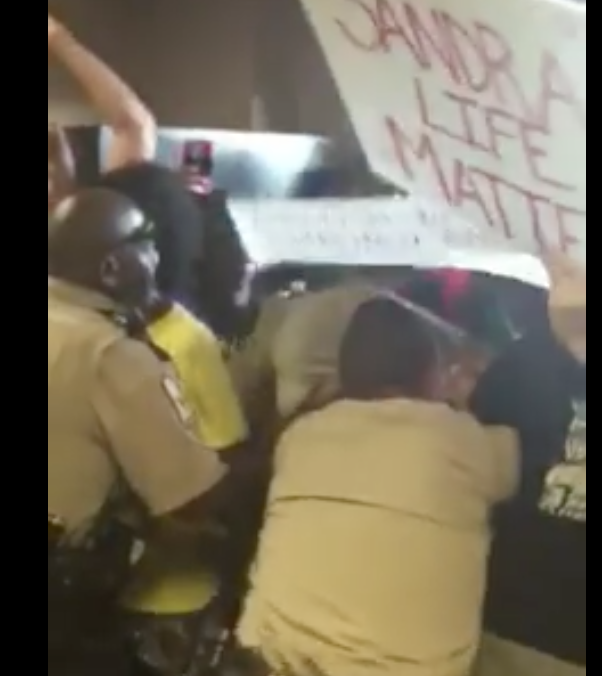 Multiple videos from multiple angles all showed the same thing: people chanting “Sandy still speaks” for a couple minutes until police officers come out of the jail and into the lobby and begin pushing, shoving and sometimes hitting them until they shove the majority of them out the doors and chain them behind them leaving a few trapped inside. At the beginning of the conflict, one woman stands in the center, determined to be peaceful, her hands raised high in the air, repeating “Sandy still speaks” until it appears she is struck and falls. The unnecessary escalation led to great sadness and confusion. People milled around shocked. It was exactly the kind of police-initiated escalation that cost Sandra Bland her life. As we struggled to overcome our shock, we had no idea that around the corner troopers in riot gear stood ready to charge at the least provocation. Why? It was a peaceful, organized protest. We had made all the information about the event and the speakers public. Yet there persisted a fear. 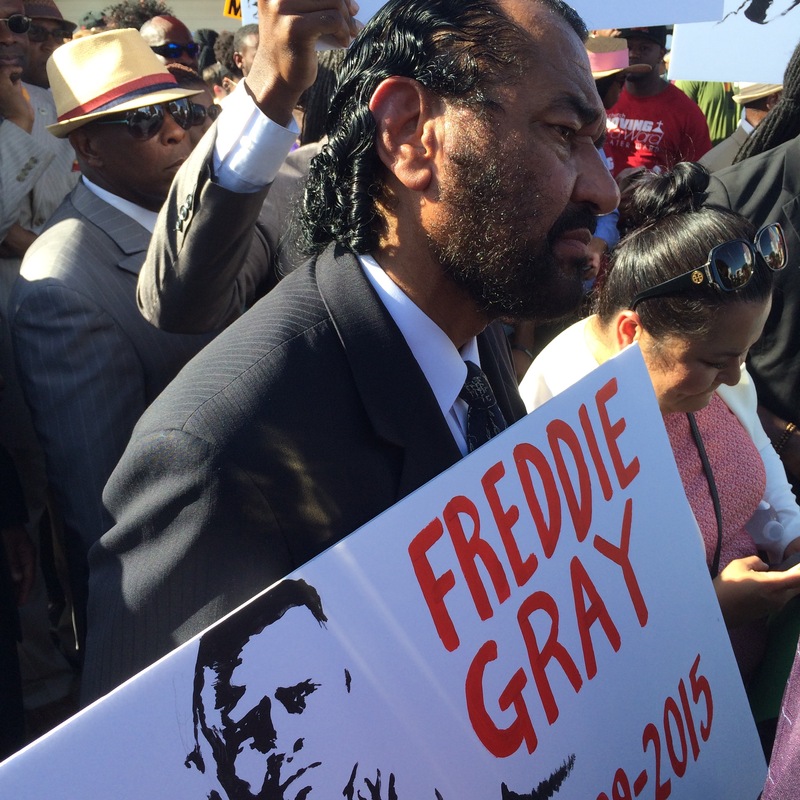 A fear of black bodies that are unapologetic about their rights. A fear that has been perpetuated by local law enforcement spreading rumors to the community that we are rioters and spreading rumors to us both today and yesterday that the KKK or other groups may try to interrupt our gatherings. 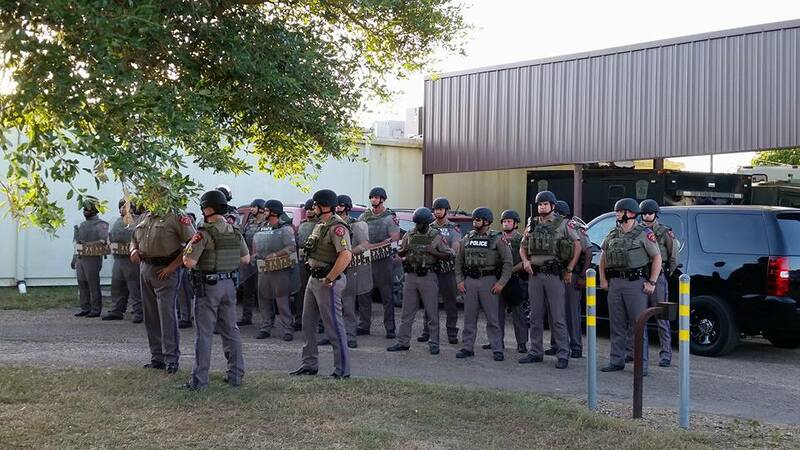 All of the fear, all of the rumors, have been encouraged and spread by law enforcement; escalating rather than deescalating tensions in the community. 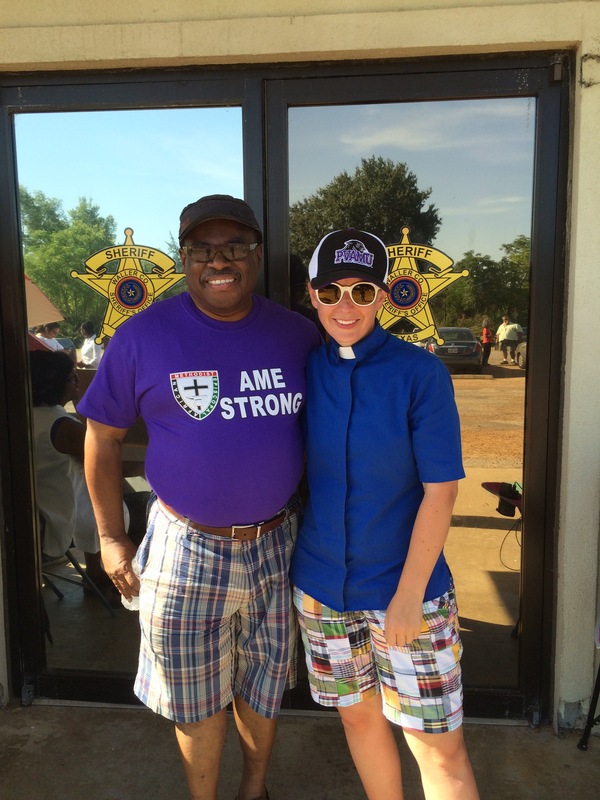 Causing the pastors that speak up to lock their doors during church services out of fear, and the pastors that do not speak up to encourage their congregations to see us as outside agitators. Yet, if we are to be criticized as outside agitators for journeying into places of pain with a message of justice and love, then we are keeping good company with Jesus Christ who spent his life doing just that, turning over tables when necessary; as well as Paul after him, who traveled even further abroad, disrupting the plans of the Romans and the business of the Greeks. As the dust settled, an older woman, knocked to the ground by the domino effect of the police shoving, was loaded into an ambulance; garbage lay scattered; and five sets of eyes wiped away tears as those trapped inside were released and their mothers returned. “What did Sandra Bland do wrong?” the reporter from Memphis asked as we arrived at the Waller County jail on Day 11 of what is now 21 days. “She was black,” my friend Andrea Sawyer-Gray, Curator of (Her)story, replied without skipping a beat. In the undertone were the echoes of another truth: she was black and unapologetic. 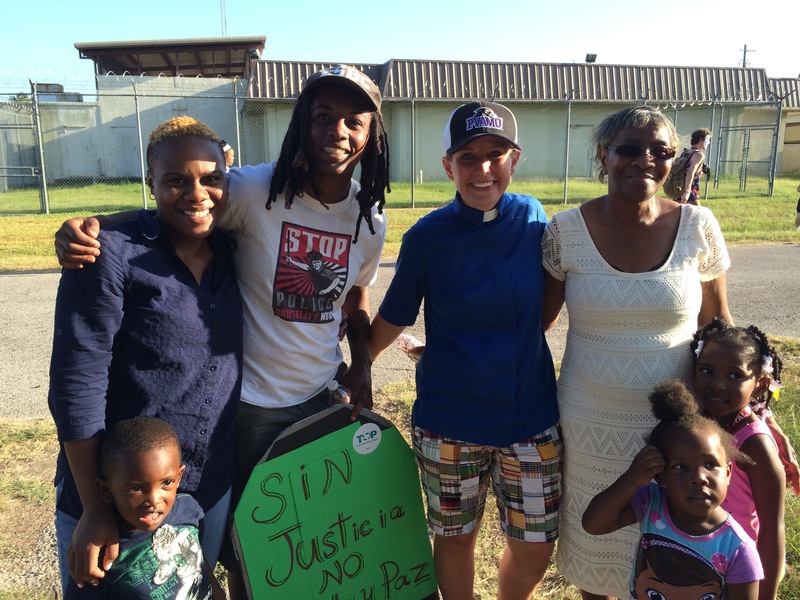 For the past three weeks of sitting outside the Waller County Jail, I have heard Sandra Bland’s voice consistently. So has everyone around me. Every time I have come near a microphone – whether at a rally, poetry event or church pulpit – my phone has come out and her voice has been heard over the speakers. She is brilliant. She is powerful. She makes me want to say “Amen” after nearly every line. She is humorous. She is courageous. She is inspiringly loving. She is unapologetic. She is. To me she is; not she was. She is lively and vibrant; and every day I have to remind myself that she was. My mind has not been trained to associate her name with a mugshot; I have averted my eyes so that the image her name summons is a smiling face saying, “Good morning, my kings and queens.” I have to remind myself each day that though her voice can never be silenced, her life has been cut short. 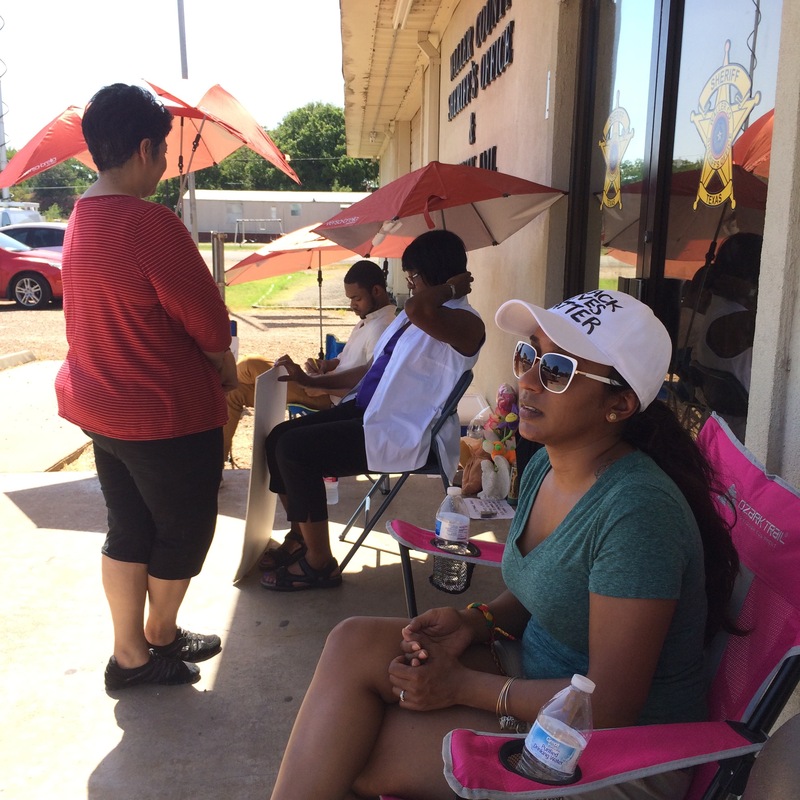 Yet, I am not sitting outside the Waller County Jail because Sandra Bland died. 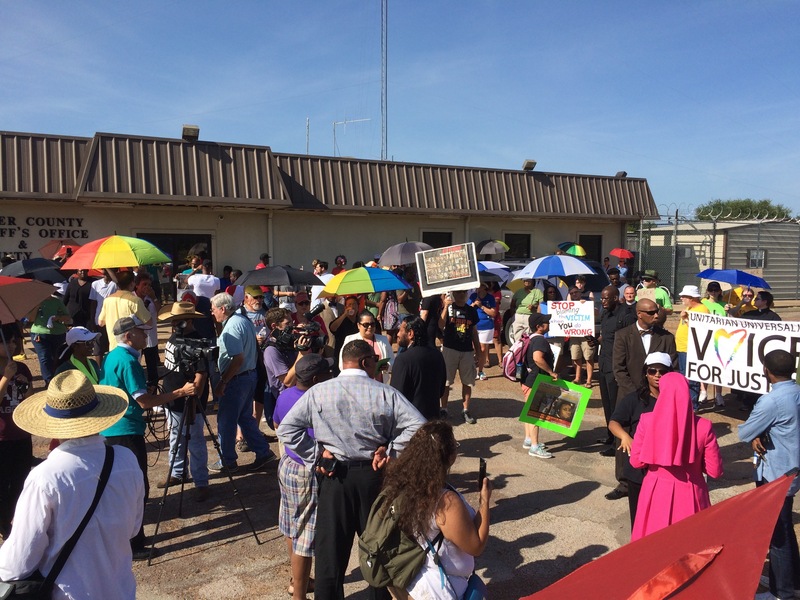 I am sitting outside the Waller County Jail because Sandra Bland lived. She lived with courage and boldness and brilliance. Her life commands respect; her life demands honor; and her life requires that the truth be told: and woe to those who try to hide it. When they use her boldness about her rights to assassinate her character, they assassinate those same characteristics in so many women in my life that I love, respect, revere. They are portraying as condemnable the very things that the world needs: this holy boldness, this truth telling, this assertiveness, this unwillingness to tolerate injustice, this belief that rights apply to all people regardless of the color of their skin. 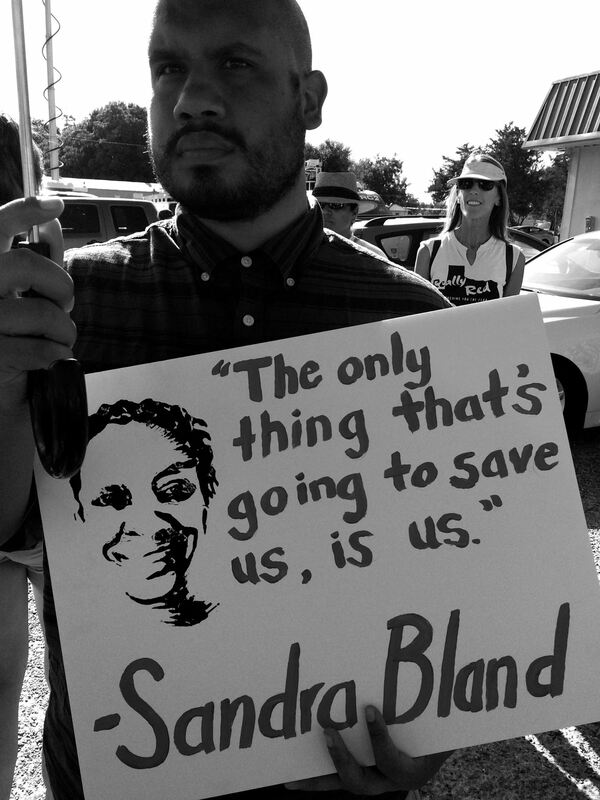 I am not interested in what Sandra Bland should have done to stay alive, I am interested in what we need to do to demand and create change to make sure that our sisters do not find themselves on the wrong end of a stun gun, pulled from a car, pushed to the dirt in front of a church, while a white man forces his will physically on her in order to restore his hurt pride. I am not interested in respectability politics that would portray as less than polished a sharply, keenly cut diamond. 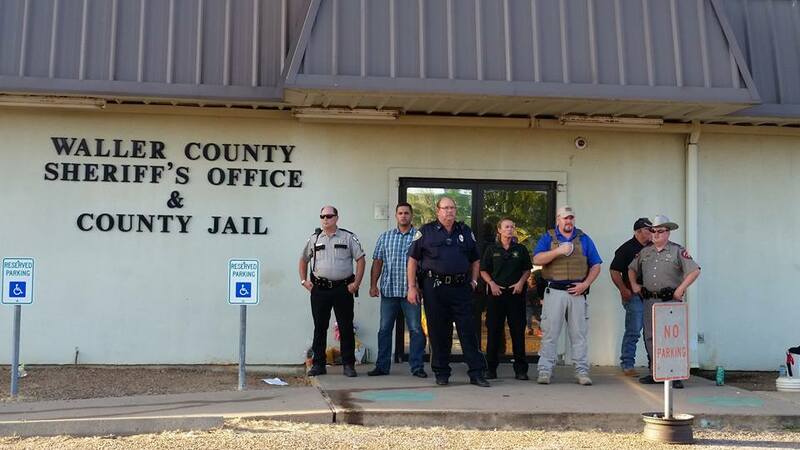 So, because I know that what I am doing, sitting at the Waller County Jail, is not the safest option in the world; I need you to know, for the record, why I am there. In case I am ever not here to tell you myself. I am there because God called me to be there. I am there because of Sandra Bland. I never knew her, but she has insured that we will never forget her. I am there because Sandra Bland said that we do not have to wait for someone important to come along, we each need to begin taking action. We need to stop saying “I knew that was going to happen” and start doing something. I am there because Sandra Bland was unapologetic about her faith, and the church bears the responsibility to honor her life, her testimony and her witness. But the implicit truth behind this all is that I am also there because of you. 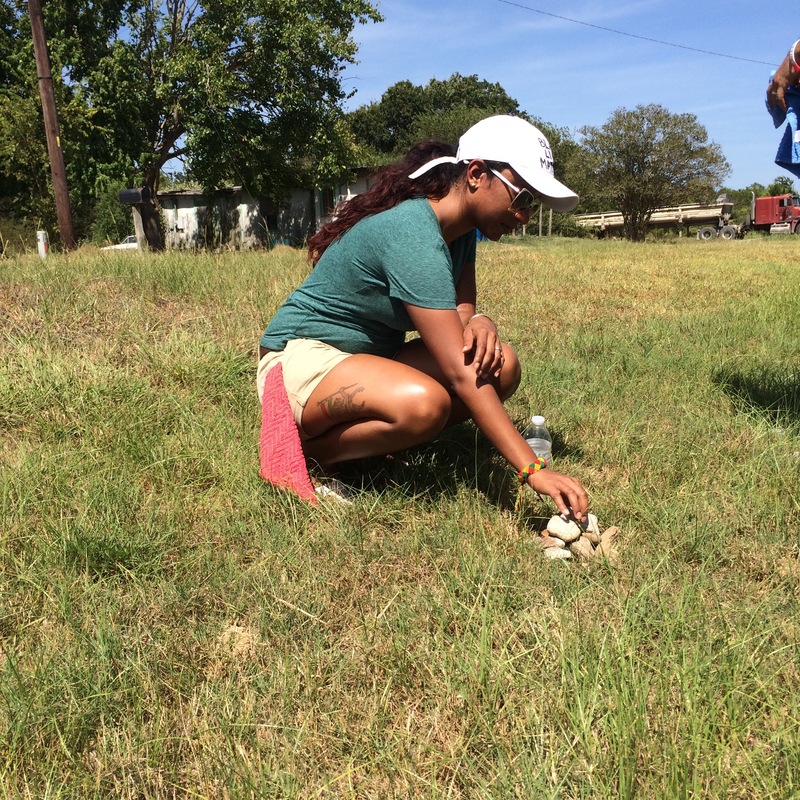 I am there to honor all of you who say of Sandra Bland: “That could have been me.” You are life. You are power. You are truth. You push against the lies and injustices of the world and refuse to accept them anymore. By refusing to accept them, you uproot this culture of white supremacy, the prioritization of the comfort of white people over the lives of black people, this false system upon which our culture has been built, that has done harm to those that look like me as well as those that look like you. This system that has minimized me as the one to be protected by authority figures, and endangered you as the one who is the threat to authority figures. In the midst of all the lies and propaganda and skewed media, you remain stalwart. You are brilliant. You are glorious. You are the revolution. You do not need me to tell you that, for black worth can never be given by white lips. It simply is. Immutable. Which is why you don’t need me to agree with you that you are magnificent, beautiful, bold, brilliant. Yet, therein lies the very point: you don’t need me to feel comfortable with your self-love. It is this very self-love that stands up to a culture of white supremacy, seeking to prioritize the comfort of white people, and lets that culture know in no uncertain terms that you do not need them to feel comfortable about the way you feel about yourself. In that is the revolution. Your love is the revolution. So while I know that you do not need me to agree with you, I just needed to say, for the record, just in case I am ever not here to say it myself, that I do: I agree with you. You are glorious. Your love is the revolution. With all my love to Shante, Sharon, Nadiera, Theresa, Ebony, Deborah, Secunda, Morgan, DeAndre, Mellany, Brandi, April, Efe, X’ene, Karisha, Carie, Rayla, Konji, Jessica, Andrea, Chris, Christian, Tori, Brandi, Thasia, Lois, Shawn, Mia, Tracy, Fran, Nikala, Kelene, Hameedah, JJ, Christie, Sheletta, Krystal, Danita, Britt, Felecia, Connie, Waltrina, Octavia, Jennifer, Jasmine, Tasha, Tiffany, Isata, Dana, Robin, Kelly, Keisha, Chanequa, Rozella, Auriel, Candace, Erin, Navida, Garlinda, Angela, Jalantae, Faith, Ryan, Kay, Jasminne, Vascola, Bird, Tasha, Lanecia, Tiandra, Zelma, Lethee, Cy, Sonia, Attaya, Chenda, Lenora, Mischelle, Genesis, Tahieta, Evon, Ryan, Juanita, Janae, Misty, Rediet, PK, Wanda, Carla, Tierra, Ada, Tam, Destiny, Pam, Shekita, Joan, Kim, Parisse, Dara, Adrienne, LaTrelle, Angelita… and you.